#loveisgoodmedicine Our families are blessed through our community partners who share our belief that love is good medicine. Eggs on the Beach 2018 raised $15,000 worth of love medicine for our local Fisher House. 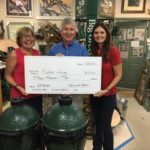 Let’s choose our attitude of gratitude for Susan and Wayne Kiley of Bay Breeze Patio for their big hearts for our mission.